Land Rover iPod iPhone integration kit adapter you can control volume, source, song selection, and up to five different playlists right from the Land Rover radio. Seek up and seek down And the interface charges your iPod while it's connected. 12v and 5volts USB for new iPhone and iTouch, it will pause when you listen to a tape or am FM station digital CD sound quality, because it plugs into the CD changer port of the land rover radio. This is Not an inferior FM transmitter or modulator kit is hard wire to Land Rover radio. If using an iPhone you can also stream music from internet services like Pandora, Livio radio, i-Heart radio or online XM Sirius satellite radio. Just plug your iPod into the interface and enjoy. 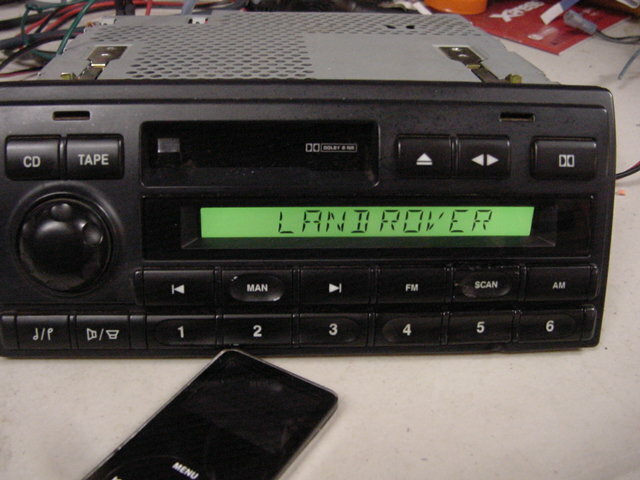 In this mode, the controls on the iPod are functional as well as the track up/down, fast forward/reverse buttons on land rover radio for controlling music playback. To use this mode, set the dip switch #2 on the interface to "Off" position. in this mode, the audio will come through Disc 5, Track 1 on the radio. 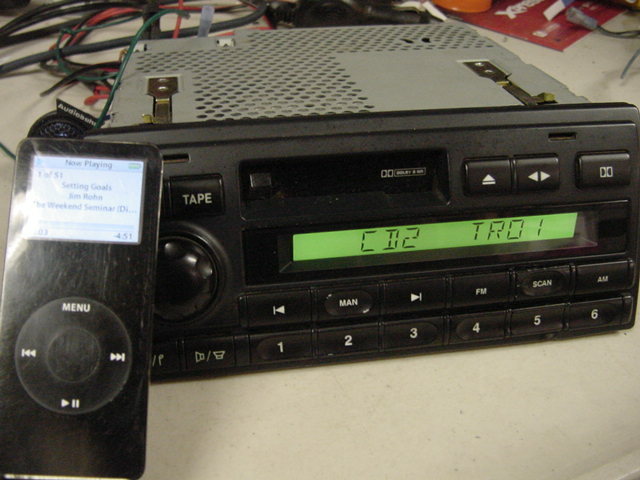 In this mode, the iPod acts as the factory CD-changer. 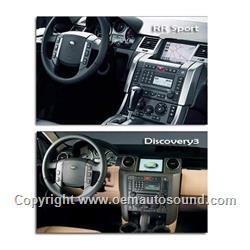 The Land Rover radio can access six discs when a CD-changer is connected, this is synonymous with six playlists on the iPod. The first five are custom playlists arranged using iTunes software. The sixth playlist is a Play All command which plays all the songs on the iPod.There is no limit to the number of songs on a playlist, but the song number display on most factory radios is only two digits so after 99 the display restarts at 01. For this mode, dip switch #2 must be in the "on" position. In order for the adapter factory radio to recognize a playlist, it must be named 1... through 5...Text can follow the name and number, such as Land 3_artist name or Land 2-jazz. For a given disc slot (1-5), if there is no playlist named followed by that number, that disc slot will not be available. text only work on Land Rover radios that support text from the CD-changer or satellite ready radios 2004 and up. In addition to the iPod input on the land rover interface there is an auxiliary input (RCA) for use with another source, such as a DVD, Mp3, satellite radio, and etc. The aux input is accesses using disc 6 track 1 using the factory radio controls. This aux input can be used with or without the iPod connected. When using the aux input the Play All mode is moved to the Disc 5 slot and the 5 custom playlist is lost. To use the auxiliary input on the interface, dip switch #1 is set to the "off" position. Manage the iPod via your land rover radio's CD-changer controls adjust volume, track up/down, fast forward/rewind use up to five playlists (select five favorites, or Auto Playlist will let you choose from the first five on your iPod.) Direct Mode allows you to control everything via the iPod itself, giving you access to all playlists (requires a DIP switch change on the iPod adapter) compatible with all iPod and iPod mini models equipped with a dock connector will work with land rover steering wheel controls. If factory CD-changer is present it needs to be remove lrn 50500. This iPod interface comes with the long cable to plug behind the land rover radio, CD-changer cable for under the seat is no longer available, works with iPhone iTouch all models. I don't write reviews often as I expect the product to work without issue. In that regards, this iPod adapter works as advertised Installed this in a 2002 Land rover Discovery with its factory AM-FM radio tape, there is a connector in back for the remote CD changer. That's where you connect this gizmo, instead of a changer. so i lost the CD changer Just pulled out the radio, connected this converter to the changer port, plugged in the iPod cable and Voila! No more hunting for an "empty" FM frequency, putting up with noise static & interference I highly recommend this product.